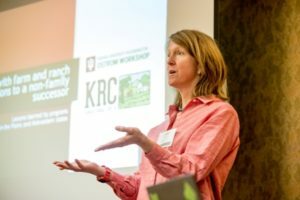 Director of the Purdue Initiative for Family Firms discussed research on farm family businesses. 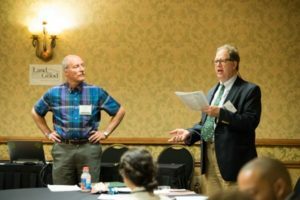 Jon Jaffe, Farm Credit East, and Kip Kolesinskas, a consulting Conservation Scientist, addressed the growing challenge of farmers without successors. 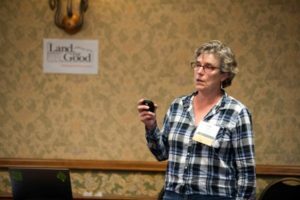 “It was a real wake-up call to see how few farmers age 65+ have a next generation working on the farm with them,” said Cris Coffin, Policy Director at Land For Good. New research from American Farmland Trust and Land For Good shed light on what these trends mean for the future of New England agriculture. 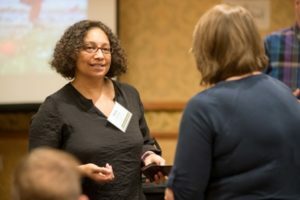 Julia Valliant, a researcher with The Ostrom Workshop of Indiana University, spoke on assisting transitions to non-family successors. Scott Marlow, Rural Advancement Foundation International, led a roundtable discussion of transition planning and farm programs. 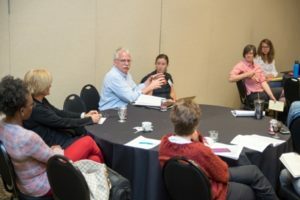 Succession and Transfer looked at building succession advisor teams, farmers without successors, and connecting transition planning with farm programs. This track examined the multiple challenges around farm and ranch succession. Panelists discussed the challenges around succession planning, and gaps across regions in expertise and advisors to assist with planning. They addressed various legal and “soft issue” complexities, and affirmed the necessity of a team approach to guide farm and ranch families through the process. There was discussion around farmers without successors, and how tax policies and farm programs aid or impede successful transfers. Many farmers and ranchers do not have identified successors. This is both a challenge and opportunity. We examined research and programs focused on this audience. What do we know and how can we tailor assistance to their circumstances? Snapshots and stories from the field of successful and innovative strategies to engage farmers and ranchers in succession planning. The discussion revolved around how transition planning does and could intersect with government and NGO programs and policy. Examples were drawn from risk management, credit, conservation and mentoring programs. It takes a team to help farm and ranch families plan for succession. In this roundtable, practitioners dug into how to build and improve succession planning advisor teams. Issues included communications, confidentiality, and coordination challenges, along with strategies to recruit and train providers. Discussion of the hurdles advisors face with their transition clients—such as entity formation, taxes, operating agreements, and financial viability. What are good practices and areas for improved techniques? Legacy Letter: Letters and stories producers write as part of their succession planning. In The Future of Family Farms, edited by Teresa Opheim. Critical for transition to include the transfer of farm-specific and local knowledge as part of the plan. Specifically address the “farmer’s boy syndrome” wherein next generation is in middle age or beyond, without having any management experience or responsibility. Use farm leaders—credible people to tell producers they should do this (planning). Successful Farm Transfer Planning for Farmers without an Identified Successor, and Farm Succession and Transfer: Strategies for the Junior Generation by Land For Good. Necessity of 1:1 consultation. It’s time consuming and expensive. Someone (not family) to hold the whole thing together. International Farm Transition Network’s “certified” farm transition coordinators complete a two-day training and provide succession planning facilitation in several states. Ag Transition Partners, four consultants who offer sustained succession planning coaching. Available through Knowledge Navigators. A team of advisors is essential. See, for example, A Team Approach to Farm Succession Planning (Land For Good). Majority of research and programming assumes intra-family succession. See Keeping It In the Family: International Perspectives on Succession and Retirement on Family Farms, Matt Lobley, John R. Baker and Ian Whitehead, eds. Vermont Farm & Forest Viability Program funds advisors to work with transitioning farmers over 2 years. MA State Department of Ag Resources’ Farm Viability Enhancement Program contracts with consultants to do succession assessments. FSA’s Agricultural Mediation Program can help with affordable succession planning in many states. See also Coalition of Ag Mediation Programs. NY case management approach of core consulting team, using Ag Mediation Program and grant funds. Encourage BFRDP to focus more on succession planning programming. Gaining Insights research paper examines farmers without successors in New England and NY. Amend federal tax code to provide for a capital gains exclusion on certain farm/ranch transfers. Provide federal block grants to states to fund technical assistance for farm viability and succession planning. (Some states do fund this.) Option include heir property/fractionation as new statutory interest in the USDA Beginning Farmer and Rancher Development Program. Designate farm transition as a resource concern within USDA-NRCS programs. Broaden types of cases that mediation programs can address, including tenure negotiations and succession planning. Integrate farm transitions into Risk Management Agency programs. NRCS designate farm transition as a resource concern.